In a mobile world dominated by so many different kinds of smartphone games, the match-3 puzzle games definitely belong to a world of their own. Due to the immense popularity enjoyed by this genre, the match-3 puzzle game space has become a lot cluttered. Because of these reasons finding a fun and addictive match 3 game that will keep your attention each time you play is not easy. To help, we looked and discovered one fun match 3 game that you will enjoy. Let’s see what the game is about. 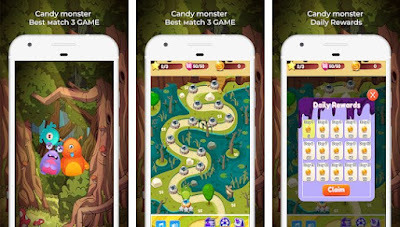 What is Candy monster match 3 game all about? Candy monster match 3 game is developed for Android users as one very easy for playing, highly fun and addictive puzzle match 3 game, especially created for users to have fun and test their matching skills in the same time. With amazing HD graphics and simple controls offered, the game allows players to enjoy swiping and matching similar shapers in order to get their high scores and progress. Getting addicted on their first try, the game is suitable for all ages, offering each player to discover and match similar shapes, progressing and keeping him interested in playing. This match 3 game offers various amazing features that will keep the player’s attention through each mission and get him addicted to playing fast. The task of the player on this game is simple he needs to discover similar shapes in order to collect points, testing his matching skills with each swipe. Just by swiping 3 of the same jewels, the player will get scores and get the chance to progress even further. Each player that progresses the most and has the most skills from the game will get the chance to increase his scores even more with the boosters. The player will just swipe and match jewels using a single finger, clearing the similar jewels. Not only that but also the game offers daily rewards for its players and offering them to do lucky spins, winning more of the rewards. Free and yet with some optional in-game items requiring purchase, the game offers the option for the user to turn off these payment features by disabling them in the phone’s settings. Download it on Google Play now for free to discover similar shapes, match them and win points!